Her voice is low, and I am conflicted. I should not be listening to their private conversation. Yet my curiosity is overwhelming. What has Father done? My thoughts turn to dark things. Who would be down there? Was it father again? Does this have anything to do with Mrs. Tusk? A giant, crudely made table stands in the middle of the room, surrounded by rough, hand-hewn wooden benches. Fresh bloodstains mar the table's surface, and an assortment of surgical instruments sit on a nearby tray. As I part my lips to breathe, I find I want to draw him in even closer. And, as if by some unspoken magic, he leans in. This is my first read by Jessica Verday. Admittedly I have her other Trilogy (The Hollow) sitting on my shelves and heard amazing things, I have just never gotten around to picking them up. 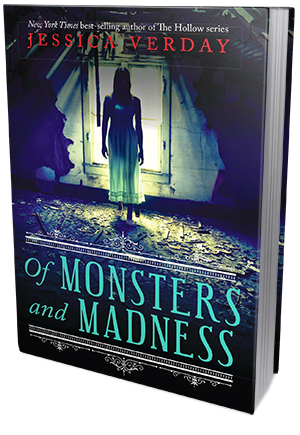 However, the allure of, Of Monsters and Madness was just too much to pass up. This book was dark, haunting and somewhat romantic. It was the type of dark that slips under you like a shadow and then swallows you whole before you even realize that it has happened. I'm not sure if her other books are like this but if they are, I may have found another auto buy author for myself. The world was spectacularly built and I found myself slipping seamlessly into 1826 Philadelphia. Into a world that is still growing and there are certain expectations from the society of those that come from a higher station. Though this book largely takes place in her family's home, it is pointed out that Annabel has not had the proper upbringing, due largely to her spending most of her life in Siam with her mother. This is brought up periodically throughout the book in neat ways as well. This being said the consistency and all around pacing of the book is wonderful. Verday doesn't allow the story to become boring but she also does not rush through things and miss details that truly make this story. Annabel Lee herself is a spectacular character. Given there were time that I wanted to give her a bit of a smack because she was doubting herself in her new world. However, I also accepted it to an extent because she was far removed from everything that she knew and placed into a world where you are expected to be everything she never had to be. But the thing about Annabel was that there were certain things that she just refused to compromise, like her desire to practice medicine. Though her father forbade it and she wanted nothing more than to be accepted by him, she would not compromise that part of herself. She was also devoted and kind, especially to her maid Maddy. Basically she is the type of girl that would go out of her way to help people. She also was fascinated with the macabre things that went on, and was not horrified at the things most others would have been. Annabel was a truly unique character. Allan is a sweet boy that always seems to be there in Annabel's times of need. He very much comes off as a rescuer and seems genuine in his concern with Annabel's safety. Though his coming and goings are odd, he appears to have a good heart and seems well liked by those that know him. The connection between him and Annabel is undeniable, but it is an attraction that leaves questions. These two exist in a time when it is improper to be alone but their stolen moments are almost perfect. The only question that is really left between them is his distaste for his cousin Edgar. All run ins with Edgar seem to be innocent enough but everyone including Allen seems to believe he is bad news, even though Annabel is not convinced of the same thing. I can't express how much I look forward to the next book in this series. Verday did end it with a bit of a cliffhanger and with a huge choice being given to Allen himself. This book had me hooked from its gruesome start right to its finishing pages. The way in which Edgar Allen Poe is incorporated is magnificent to say the least and I love how the author used a period of time in which this story itself could have taken place. It is a work of fiction but for anyone that loves the dark and gothic feel of Poe this book will be a quick and enjoyable read. For fans of Verday, be prepared to fall in love with her new series!